say, do you know how's to feel insecure? do you know how's to feel lonely? do you feel both ways? do you believe it? do you trust in it? you dont like you?.........so lame because the worst mistake here is say yes. I'm not that good at painting....so I wanted to start with a no so spectacular try, and this was the result. the title goes like that cuz....when I think in isolation the first thing that comes to my mind is the human kind, and the human desire to feel better,more outstanding than others....with such poor thoughts people start to isolate themselves from others in order to keep everything for them,and only them, a lonely final is the most appropriate thing for these impertinents creatures, we humans. and well...guess that's all, hope you all like it. Well it's about time for a new highlight don't you think? And this piece by alterlier is simply very well executed. Just look at the scan she worked with. 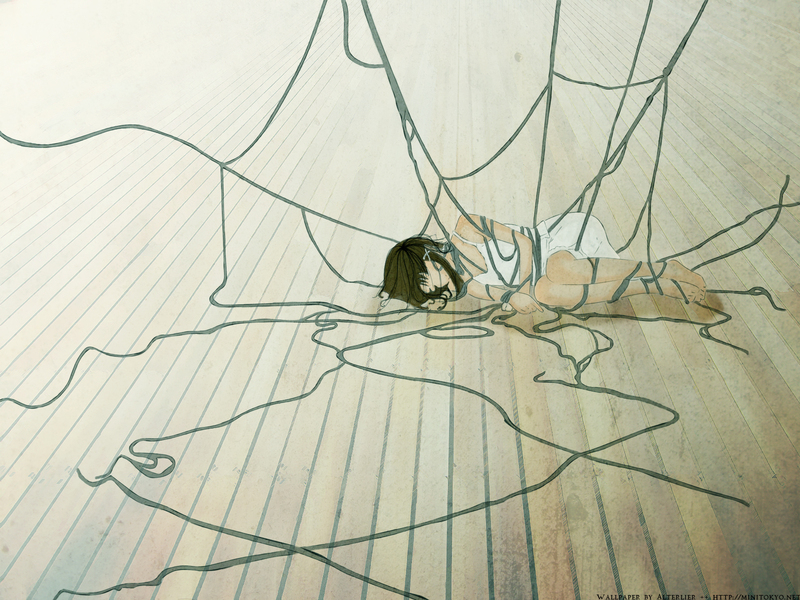 This disturbing image of Lain that's nicely put into a wallpaper is surely worth of your desktop. Proposed by flyindreams and highlighted by candy-chan. Browse Serial Experiments Lain Gallery: Recent | Popular. OMG sweet, that is amazing. I love the floor and the ropes coming from the girl. As always a unique piece from you, I love it! Great Job :D. and OMG yeah boo ya first to comment yeah *does happy dance* yay. Just amazing, I could tell by the thumb this is from Serial Experiments Lain. One of my all time favourites ... So you tried painting? Seems with that new group people are trying painting now xD I think your result came out as a positive. I like how everything fits together nicely, and has that painty look. Great great job. I like the isolation theme with the ropes. You're right about the whole isolation is humankind. A very nice wallpaper. The wires surrounding her are like a web we spin about ourselves to protect ourselves from our own sad feelings; the fact that some of the wires just drop off instead of continuing could stand for broken ties with others. A wonderful metaphorical piece; all in all, a great work of art! A really intriguing wall we have here! I admire the theme you have conceptualized and all the ideas you have integrated in the wall. Yet another wonderful addition to your prolific gallery, thank very much for sharing, as always. i liked that floor a lot and the painting over lain. I always like to read what you felt like when creating your wallpapers. And I can understand these feelings and I can see how you wanted to express them in your wallpaper. I started a wallie very similar to yours not so long ago, but I never finished it. Maybe one day I'll finish it... don't know... ^^ My thought was similar to yours too... *lol* :) Well thanks for this wallpaper. I love the soft outlines... the composition of the wires... and that you used light colors works really well too. It's right you don't have to sit in the dark to feel lonely. It's deep. I love how the colours fade out towards the upper corner, then comes back in near the bottom...the drawing style is perfect, and the wires are placed very nicely. your wall captures the concept of lain and her entanglement / fusion with the world of the wired. simple backdrop that makes the theme stand out. the only thing i felt could make this better is if you added some faded shadows onto the ground for the wires that are hanging from top to bottom in a way that compliments the way you put a shadow for lain. that way the wires would be given more depth and not just look like they are glued to the ground. ah nice theme representation! I like the colours too, it's bright, yet kinda grungy at the same time :) The floorboards look nice (I like the colours and textures), and good perspective. Is this all vectored? I do enjoy this wall very much. Lain has always been one of the greatest Anime created in my mind. I think the composition and the simplicity with which you have executed this pieces are excellent. My only recommendation would perhaps be to change that you can see the lines of the floor through the cables. I don't believe the cables should be transparent, unless that is the look you were going for specifically. If it is, then never mind XD. Well done, and keep up the great work. And feel free to stop by my page and say hello anytime :D.
It looks to me as if the person is being surrounded by a giant spiderweb but i see what you are trying to say, "isolation not necessarily means darkness" i agree with you on that.. by the way great work on it!